He said to them, "The harvest is abundant but the laborers are few; so ask the master of the harvest to send out laborers for his harvest. Go on your way; behold, I am sending you like lambs among wolves. Carry no money bag, no sack, no sandals; and greet no one along the way. Into whatever house you enter, first say, 'Peace to this household'" (Luke 10:2-5). The first reading is taken from the book of the prophet Isaiah, 66:10-14c speaks of the final judgment and the purified and joyful Jerusalem. All children of God nurse at the breast of Jerusalem — an image that beautifully portrays universal peace, contentment, and love. Slowly the image changes and God takes the place of Jerusalem — fondling, comforting, and nursing His children. The second reading is from the letter of Paul to the Galatians, 6:14-18 is the conclusion of his writing to respond to those who insisted that Christians must follow the Mosaic Law. He addresses the subject of circumcision which many Galatian Christians were submitting to and telling them that the Christian people of God are the new "offspring of Abraham." The Gospel is from St. Luke 10:1-12, 17-20 and is about Christ conferring His mission on the seventy-two disciples. Christ wants to instill apostolic daring into his disciples; this is why he says, "I send you out", which leads St John Chrysostom to comment: "This suffices to give us encouragement, to give us confidence and to ensure that we are not afraid of our assailants" (Hom. on St Matthew, 33). The Apostles' and disciples' boldness stemmed from their firm conviction that they were on a God-given mission: they acted, as Peter the Apostle confidently explained to the Sanhedrin, in the name of Jesus Christ of Nazareth, "for there is no other name under heaven by which we must be saved" (Acts 4:12). "And the Lord goes on", St Gregory the Great adds, "'Carry no purse, no bag, no sandals; and salute no one on the road.' 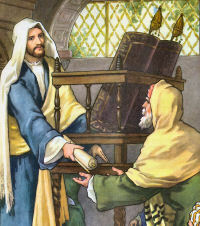 Such should be the confidence the preacher places in God that even if he is not provided with the necessities of life, he is convinced that they will come his way, to ensure that worry about providing temporal things for himself does not distract him from providing others with eternal things" (In Evangelia homiliae, 17). Apostolate calls for generous self-surrender which leads to detachment: therefore, Peter, following our Lord's commandment, when the beggar at the Beautiful Gate asked him for alms (Acts 3:2-3), said, "I have no silver or gold" (ibid. 3:6), "not so as to glory in his poverty", St Ambrose points out, "but to obey the Lord's command: it is as if he were saying, 'You see in me a disciple of Christ, and you ask me for gold? He gave us something much more valuable than gold, the power to act in his name. I do not have what Christ did not give me, but I do have what he did give me: In the name of Jesus Christ, arise and walk' (cf. Acts 3:6)." (Expositio Evangelii sec. Lucam, in loc.). Apostolate, therefore, demands detachment from material things and it also requires us to be always available, for there is an urgency about apostolic work. "And salute no one on the road": "How can it be", St Ambrose asks himself, "that the Lord wishes to get rid of a custom so full of kindness? Notice, however, that he does not just say, 'Do not salute anyone', but adds, 'on the road.' And there is a reason for this. "He also commanded Elisha not to salute anyone he met, when he sent him to lay his staff on the body of the dead child (2 Kings 4:29): he gave him this order in order to get him to do this task without delay and effect the raising of the child, and not waste time by stopping to talk to any passer-by he met. Therefore, there is no question of omitting to have the good manners to greet others; it is a matter of removing a possible obstacle in the way of service; when God commands, human considerations should be set aside, at least for the time being. To greet a person is a good thing, but it is better to carry out a divine instruction which could easily be frustrated by a delay" (ibid).